Blue Ivy Carter, Beyoncé’s newborn, has been seen in public for the first time during a lunch outing today in New York. Blue Ivy was wrapped in a black baby blanket, with what appeared to be a black scarf covering her face and Beyoncé made sure to protectively wrap her arms around the infant. 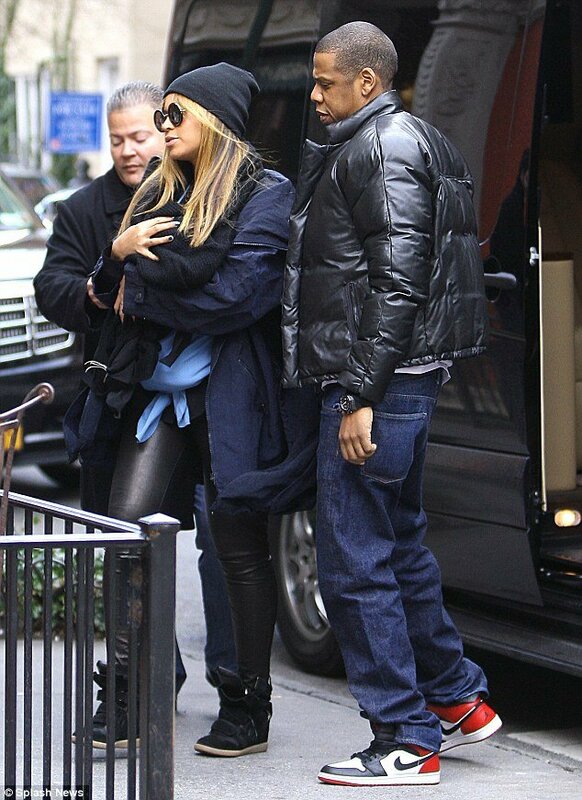 Beyoncé, 30, dressed casually in black leather trousers, sunglasses and boots. She wore a black cap on her head to keep warm. The singer was accompanied by husband Jay-Z and a team of bodyguards who kept close watch over the family as they emerged from Sant Ambroeus cafe and espresso bar in the West Village. Eyewitnesses say the new mother wasn’t feeling well and the family left after only 30 minutes. Beyoncé and Jay-Z surprised fans earlier this month by sharing the first pictures of their daughter Blue Ivy on the internet. The proud parents posted a series of intimate portraits of their beloved daughter, who was born just over a month ago. Instead of selling their first baby pictures to a glossy magazine for millions of dollars, the music megastar couple decided to take control posting snaps of Blue Ivy to a tumblr blog.